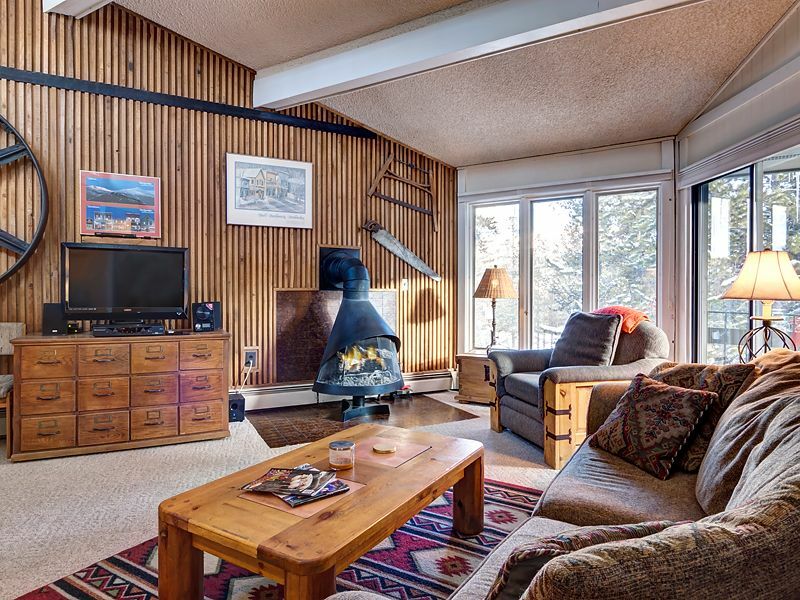 Two Bedroom, Two Bathroom, Ski-In Condominium on bus route. Located in the Gold Camp II complex. Third floor with cathedral ceiling and clerestory windows. Hot tub and sauna located on the first floor. Fully equipped kitchen, new flat top electric stove, 3 TVs, DVD, iPod dock, and deck with view of Mt. Baldy. Gas fireplace. Full size front load w/d. Master suite includes full bath and queen bed. Second bedroom also has queen bed. No sleeper sofa. Second bathroom is across the hall from 2nd bedroom. 3 TVs, wireless, gas grill, gas fireplace. Owner lives in town for any assistance during stay. I live in Breckenridge and am available for check in and assistance during your stay. Peak 8 access. Last shuttle bus stop on the way to base area. 5 minute ride. Bus arrives every 10-15 minutes 8AM-6 PM. Town bus runs every 1/2 hour 6 AM-11 PM. Hot tub in same building. Parking included. Condo is decorated with mining relics from surrounding mountains including 5 foot and 2 foot diameter pulley wheels used for hauling sluce carts. Also original doors from mine cabins. Cathedral ceilings with clearstory windows for added natural light. Full size tub and shower in both bathrooms.